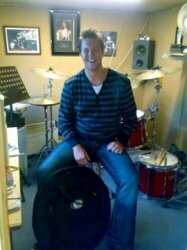 I teach drum kit in a number of schools in and around London and Essex, I teach my own syllabus which is influenced from my own studies as a student but also from my own professional experience and also includes respected books. I do teach the Trinity and Rockskool graded systems if students wish to go through these and my students have a 100% distinction pass. Along with teaching in schools I mentor students for the National Autistic Society and Essex Music Service. I hold a Level 3 Teaching Certificate in Arts and Music Leadership and am currently studying for a Masters in Teaching Music to Special Educational Needs (SEN), so you could say that I have a passion for education! I have a clear DBS, and level 3 Child Protection Certificate too. My studio is in Rainham - Essex, and available to all my students. All sessions are 1:1 and can be booked in 30 or 60 minute blocks, for £20 and £40 respectively. Whilst I ask that fees be paid on a monthly basis in advance, I aways offer a discount on longer term advance bookings, so please get in touch if you would like to know more. I teach a range of ages and abilties - including children and adults with Special Educational Needs (SEN), Autism and Aspergers. Lessons can always be adapted - drum lessons (or any music lesson) are for everybody. Drumming is an amazing mind and body work out for anyone and everyone, and I have helped hundreds of people from all kinds of backgrounds. There is compelling academic and experiential evidence that playing and studying music can improve and helps any area of life - music should be a daily activity for everyone. If you would like more information on this and what you can do to help your child get more involved in music locally, then please get in touch. 1) Music can help manage or reduce the effects of chronic (osteo- and rheumatoid arthritis) and post-operative pain. Music distracts, provides the patient with a sense of control, releases endorphins that counteract pain, and relaxes a person by slowing their breathing and heart rate. It reduces blood pressure, the severity, frequency, and duration of migraines and chronic headaches, and increases the production of immune-boosting hormones and decreases cortisol levels, which can interfere with immune response. 2) Music enhances higher brain function such as reading and literacy skills, spatial-temporal reasoning, mathematics, emotional intelligence, memory. Music improves concentration and attention. 3) Music improves athletic performance as it helps reduce the feeling of fatigue. It reduces muscle tension, which in turn improves body movements and coordination. 4) Music can help energize a person who is feeling fatigued and improve productivity. 5) Music calms, relaxes and can help a person fall asleep (as is commonly seen with infants and young children). Music has also been shown to lower cortisol levels which, in addition to boosting the immune system, also reduces stress. 6) Music can improve a person’s mood and reduce the effects of depression. Individuals of all ages and all abilities can benefit from music therapy. Previously, music therapy has been used to support emotional, cognitive and social development in many populations. Music therapy may help to promote wellness by managing stress, enhancing memory, and improving communication. Many additional studies have found that children and adults with autism spectrum disorders (ASD) respond well to music. Often, individuals with autism respond positively to music when little else is able to get their attention, which makes music a potential therapeutic tool. Children with autism are more sensitive to anxiety than the average child, as they are unable to filter out provoking stimuli. A small four-week study, conducted at the University of Wisconsin La Crosse in 2006, found preliminary success in reducing anxiety in patients with autism through music therapy. After 16 short, 20-minute sessions, during which the treatment patients listened to rhythmic music, the participants who received the therapy appeared to have decreased anxiety-related behaviors. Classical music or music with a steady rhythm is thought to be the best for alleviating anxiety in children with autism due to the predictability of the beat. Learning a musical instrument at school improves children's behaviour, memory and intelligence, a government-commissioned study has found, as ministers launch the first National Year of Music. Professor Susan Hallam, of the Institute of Education, University of London, analysed scores of researchers' studies on the benefits of music to children. She found researchers had discovered that learning to play an instrument enlarges the left side of the brain. This leads musically-trained pupils to remember almost a fifth more information. Hallam's research review was commissioned by the Department for Children, Schools and Families as part of a drive to persuade more children in England to play a musical instrument. The government hopes to double the number of children, aged seven to 11, who are given a chance to learn an instrument for free by 2011. The government says that now over half of primary-aged children - 1m - learn an instrument. A study contrasting the impact of music lessons with that of drama classes found music lessons, over time, increased pupils' IQ by seven points, compared to 4.3 points for drama lessons. Several US studies have found that playing an instrument improves children's behaviour. This was because working in small musical groups requires trust, respect and compromise, Hallam said. "In adolescence, music makes a major contribution to the development of self-identity and is seen as a source of support when young people are feeling troubled or lonely," Hallam said. But singing or piano lessons do not necessarily improve children's maths ability. "The relationship between maths and active musical engagement has had mixed results," Hallam said. Ministers say they have invested £330m in music "inside and outside the classroom" in the last year. It comes as the government launches the first National Year of Music. This will see long-haired rock guitarist, Slash, partnered with the neatly-combed education secretary, Ed , to take part in what the government has called the biggest music lesson ever. Some of the country's best-known artists, including jazz-pop singer Jamie Cullum and funk singer VV Brown, will play from the classrooms of a comprehensive in Acton, west London today. Others, such as Slash, will be recorded playing from afar for the occasion. Thousands of schools across the country will link up to hear and see them. said: "Music is at the very heart of British popular culture – it's what kids talk about, it's what they aspire to. It's fantastic that TV talent shows like X Factor attract millions of viewers each week, but young people need to know that they can only become stars by mastering the basics when they're young and by learning about a range of music, from classical to country. This is exactly why we need world-class music education in schools. We know that learning to play an instrument can improve both reading and writing. It is right that music should play an important role in school life and beyond." I am passionate about teaching and like to put my personality and sense of humour to good use. All of my lessons are kept relevant to the subject and are based on realistic musical situations , lessons are informative where the students can apply what they have learnt in context. I welcome all levels and abilities and I'm fully CRB certified. All tuition takes place at my private studio in Rainham, Essex where there is a fully sound proofed room and equipment. If you live in the Braintree, Chelmsford or Colchester area, I'm available for home visits.